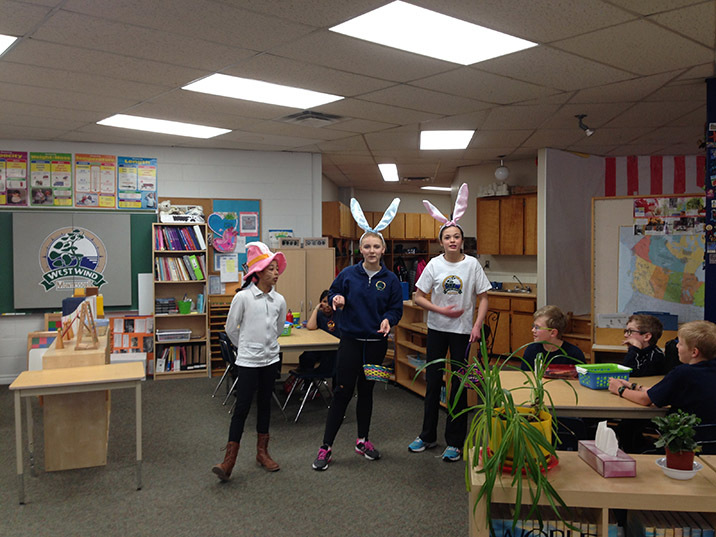 These busy bunnies helped Dearcroft students celebrate Easter with an egg hunt held as a fundraiser for the Free the Children Club. Members of the club are diligently working towards their goal of raising enough money to build a school in Kenya. Though it is a lofty goal, club members have already held several successful fundraisers, including a bake sale, Rafiki bracelets sales, and a dress down day. We look forward to more events as these dedicated grade four to eight students continue their weekly planning meetings. With Easter weekend now upon us, spring’s recent arrival mirrors the promise of rebirth and renewal that accompanies the season. Slowly, the snow banks have receded and the longer days, gifting us with sunshine and warmer temperatures, have given way to bird song, buds on the trees and the first plants to emerge from the earth. The Spring Term is always one of anticipation… punctuated with numerous events and fresh air activities, a welcome respite from the long shadows of winter. Looking ahead to the warmer months, we are excited to be expanding our program to offer organic gardening, through the creation of garden boxes at the back of our new expanded property to the east of our main driveway, adjacent to Lawson Park. In the Fall term, we prepared a garden area, trucking in compost and organic triple mix. Dearcroft parent, Christine Fortier (Maya’s mom) an avid organic gardener and passionate advocate of wellness and healthy eating, will be spearheading this project. Christine roto-tilled the soil and laid out the garden with our sr. students in October and she will be engaging all of our students in various aspects of planting and creating a vegetable garden. Through working with the earth, our goal is for the children to learn to appreciate the source of nutritious produce and become advocates for their own health and wellness by making healthy dietary choices. Closer to the centre of the new property you’ve no doubt noticed the polar bears that have graced the edge of our east field below the towering silver maple. Created by Oakville artist and Dearcroft parent, Bert Jackson (Maya’s dad)… since their arrival shortly before Christmas, the polar bears have generated much interest and conversation among students, staff and visitors! As our ‘artist in residence’, Bert has initiated a series of Spring Term modeling workshops with our students, sharing his enthusiasm and skill as a sculptor. We are planning a special event for the first weekend of June to showcase these creations. Similar to last year’s highly successful Art & Biodiversity night, this event (June 5/6th) will be a wonderful celebration, showcasing the creative talents of our school community. Additionally it will feature food, music and displays/workshops highlighting first nation culture, an area of study, we’ve been pleased to expand within our curriculum this year. Please be sure to circle June 5th/6th on your calendars! In closing, we wish you a relaxing Easter weekend with your family and look forward to having you join us on campus in the spring term… along with the return of warmer weather, sunshine and even Blue Jay baseball (a true sign of spring)!